The BSA Comet Evo Silentium is a very flexible, all rounder air rifle, ideal for taking out rabbits, or shooting targets on the range. The synthetic stock is made out of a strong Black polymer, which is both is comfortable to hold, and quick to handle. This stock is highlighted at the fore by means of an embossed hand grip, with the pistol grip chequered for a positive grip, even in wet conditions. 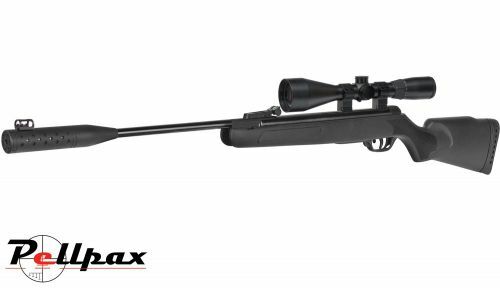 The action is full power, running around the 11.5 ft/lbs mark, so packs enough punch for hunting, and propelling your pellet down range for a bullseye every time. This is then coupled to a BSA cold hammer forged barrel which provides excellent consistency and accuracy every time. At the end of this barrel is one of BSAs new Silentium silencers, which is fixed onto the barrel to dramatically reduce the muzzle report for stealthy shooting. Sights - Front Fiber sight & rear Fiber adjustable Sight. Add this item to your basket & spend an extra £350.01 to apply for finance.